I called Marie on New year’s Eve to check out her cell phone number, as the CBC wants to do a live interview with her. I found her in a hayloft with a group of activists (and possibly farmers as well). It was evening and they were having tea. She seemed very relaxed and said that the Palestinians certainly know how to have a good time. That’s very heartening to hear, as a counterbalance to the despair over the loss of their farms. She wishes you all a Happy New Year. We have moved to Azun, West Bank to work with farmers and villagers as the wall construction approaches and they are being prevented from going to fields. We do night patrols in villages where the army and border police are active. We try to watch to see how they treat people. They come, kick down doors and haul people out. In response to the protest against the Wall, there is much harrassement, intimidation, identifying and arresting leaders. I’ve come quickly to the Internet cafe in Qalqilia today, before we return to Jeyyous immediately to try to interfere with the military taking revenge on the villagers. We kept up patrols all night there last night, but fortunately no soldiers came. We had to come back to Qalqilia today to get our “stuff” (toothbrushes, etc.) as we meant to be away only one night, not a week. A competent photographer has arrived and promises me pictures and help with sending mine! Internet access is limited while we are in the villages. Marie Campbell, retired UVic professor acting as a volunteer observer in the Occupied Territories, was part of a protest at Jeyyus, Palestine. Marie and a group of international observers walked at the front of a peaceful march organized by area farmers until they were stopped by the Israeli army and police forces. “We just sat down”, said Marie, “Then they tear gassed us. Small boys began throwing stones and the army returned fire”. “This is a very peaceful group of farmers. We met last night and it was agreed that we show our resistance to the Wall in a nonviolent protest.” People from 12 villages surrounding Qalqilya gathered to hear speeches when the army tried to provoke them to react. “It’s really important for these people to resist peacefully, but the media seems only interested in reporting violence”. These people have had title to their land since the British Mandate. The land is very fertile and there are aquifers. 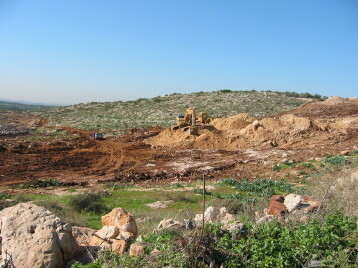 Settlements are encroaching on their farmland and now the “security wall” is taking a tremendous amount of land and cutting up the communities. 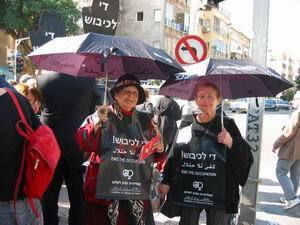 Today, I am in Tel Aviv for a Women in Black demonstration and to take a break. My group was being called to an emergency in a village called Es Bet Salman, just as I was leaving to go to the Qalqilya checkpoint to meet up with other internationals going to Tel Aviv. In the village, it was said, soldiers were massed and attacking property, busting up things. It is not clear exactly what is going on but the remaining seven of my group headed off there. There is a demonstration being planned for Sunday, I mentioned before. It is coming from the villages and is protesting the “security fence”. Perhaps this attack has something to do with that or just with the resistance the villagers and farmers are making to having the fence constructed across their property. 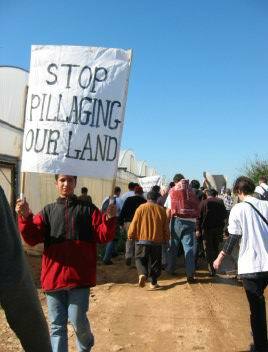 The land is fertile here, many greenhouses, too, and their business of these farmers is being undermined. It is now 1:15 pm on 26th and I have come directly from the scene of the action to the Internet cafe. I arrived at the scene about 10:45 am, but the army started early in the morning before the family was out of bed. It must have been 11:30 am [1:30 am. in BC] when I called you [Susan]. After I lost contact with you, the confrontation between the children and military continued, and I got my first whiff of tear gas. I was choking and the local ambulance attendants invited me to get into their vehicle. (We work with them, too, as you know). I wasn’t heavily gassed, luckily. In the course of things, neighbours of the detained man were hauled out of their homes and had their identity cards seized. We tried to interrogate the soldiers about that, but they were really sick of us by this time. Can you imagine this picture – a virtual war going on and these seven internationals, mostly young people, surrounding the army vehicles and interrogating soldiers? Again, absolutely surreal. We challenge them on anything we can think of. “Do you want the world to know that you are not following the Geneva Conventions?” “What kind of soldiers are you to be pointing guns at children?” and so on. I talked to one soldier who said he wanted to go to university after doing his national service. I asked him what he wanted to study and got around to talking about the Palestinian boys who also need to live long enough to have a career and a life. The soldiers are of all kinds, you can imagine, they may or may not like doing what they do. Some, indeed, seem to enjoy it. Others clearly are not comfortable with violence and our questions. At that time, I noticed that increasing attention was being paid to the apartment houses in the area and soon the soldiers dynamited one of them. And then about noon or 12:30 they were ready to leave with their heavy equipment, sniffer dogs, tanks, trucks, earth movers, Armed Personnel Carriers, and finally all the jeeps carrying the dozens of men who had been holding the children off with percussion (sound) bombs, tear gas and rubber bullets. After the soldiers left, we joined a crowd of neighbours and friends looking into the bombed house and commiserating with the mother of the man who was taken, and with his family. It was a nice home, now with a hole blown out of the wall, windows and frames gone. His brother told me that the man was 28, with a wife and little child, and it was the brother who told me he was a policeman. I really want to find out more about this apparent targetting of policemen. A taxi driver told me that the Israelis saw this area as “trouble”, and perhaps they think that Hamas has people here. But the army does not need to have or show any evidence against a suspect (I kept reminding the soldiers that he was a “suspect”, not a terrorist, as they were calling him). They can and will just take a suspect, beat him up, and often just shoot the man, without any benefit of trial. This is routine, not an isolated instance. The next stage is punishment of the family – coming in the night, and bulldozing or exploding the homes of parents, brothers, and other relatives. I haven’t emailed the report on our training yet, but I will mention here that ISM doesn’t take a position for or against any of the political factions in Palestine. Rather, we offer an example of how to nonviolently disrupt the Israeli efforts to control every aspect of Palestinian life. And of course, we are offering our services to help protect Palestinians from the systematic terror and violence the army wages. It seems that the Israeli strategy includes preventing Palestinians from educating their children, as they are adamant that curfew means the schools should be closed. But one Palestinian educator told me that during the first Intifada, they did close the schools and a generation of children lost their chance to be educated. So they are determined not to let that happen again. Just to help you better understand the situation today; while the boys stone the soldiers, tanks, etc, for “fun”, they are also deadly serious about doing it as resistance to the soldiers, too. They won’t be scared off by the threat of violence. Throwing stones is what know how to do and all they have the resources to do.